This is Wiliam (Bill) Hossack. Bill got a Ph.D. at DDO designing and building an oscilloscopic spectrophotometer for analysing the spectral plates taken with the 74-inch. He went on to take a position with the Department of Defence in Ottawa. On July 10, 1961 he and his wife and small son were returning from Montréal on the infamous old highway between Montreal and Ottawa. Their car collided head on with another and both Bill and his wife were killed, though the boy survived. A real tragedy. Both were accomplished musicians. That round thing in the picture is the oscilloscope. The chap with him may be Bob Baglow. 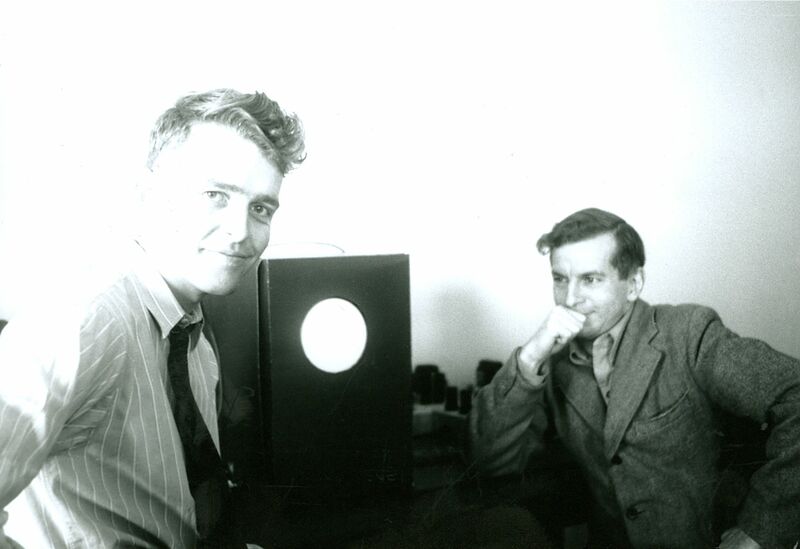 I am not sure what Bob's connection with DDO was, but I think he built the first photoelectric photometer at DDO. Later he moved to Halifax in a position with the federal government. Maybe he was getting an M.A. Yes, he wrote a thesis on photometry at DDO.